ARE YOU READY TO BECOME A DIGI-SAPIEN? Identity, self-expression, fantasy, creativity - they’re at the core of what it means to be human. As a digital fashion house designing clothing that is always digital, never physical, it could seem as if what we do comes from a purely technical perspective. While it’s true that The Fabricant always strives to produce ‘better than reality’ digital-only fashion garments, during the design and ideation process, human needs and wants form the basis of our thinking. How can we be a catalyst to greater personal expression? What should we do to elevate emotional connection? Where can we push boundaries to open up a new space to dream and create? These are the questions that inform our work. They’re ideals that frequently get left behind in the current fashion dynamic. The Fabricant is dedicating its energies towards creating a new fashion industry - the digital-only fashion sector - one that is collaborative, creative and playful, that returns to the heart of what fashion can be. Our desire to be part of a new, more open and transparent fashion world is why every month we’re doing a free file drop, or FFROP, as we like to call it. Each FFROP features an outfit from the DEEP digital fashion collection, the world’s first fashion design collaboration between a human and a computer (the human designer is The Fabricant’s creative director Amber Jae Slooten). Allowing our files to be downloaded and used for free is our way of committing to the digital fashion world we’d like to create. FFROP #1 from last month is still available. FFROP #2, which lands today, is also free for anyone to download. As The Fabricant sees it, consumers aren’t mere passive observers of our work but co-collaborators inspiring us towards more meaningful creativity. Their imagination when they use our files of digital-only clothing is another step towards everyone being able to fully express their virtual identity in the way they choose. What we wear and how we wear it has long been the way humanity has projected itself on to the world. By transplanting that instinct into the digital space we open up an arena of endless creative possibility, where the inner self and its outward expression can meet beyond the limitations of the physical realm. Are you ready to embark on a journey that defines how we express our virtual identities? Are you ready to join The Fabricant in the movement that uploads the human to its next level of existence? We’re ready whenever you are. We all know how a fashion drop works, don’t we? It’s a limited-edition collection, probably a collab with a big name designer, only a small quantity of product available, with an even smaller window of purchase opportunity. There’s a manufactured sense of urgency and exclusivity, pushing consumer demand. The price point is high. The only time to buy is now, now, now! It’s a very smart sales strategy. But how do you introduce product if, like the Fabricant, you’re a digital fashion house operating at the intersection of fashion and technology, creating clothing that is always digital, never physical? Of course we can always follow the rules of drop culture and play by fashion’s established norms; just do what’s always been done. Or, we can recognise that we’re spearheading a new sector of digital-only fashion that has no history, no format and no existing template to follow. From this standpoint all things are possible. The Fabricant already creates in a boundary-free space, beyond the structures of the physical realm. We operate in a world where waterfalls flow upwards. Where shoes fly and jackets dance – without the aid of a model. It’s instinctive to us that we should avoid limitations whenever possible. That’s why, starting Monday 28th January 2019, we’re dropping the first in a series of digital-only fashion designs by The Fabricant . Except we’re calling it a ‘FFROP’, not a drop: a FREE FILE DROP. We’ll do one ffrop a month for the rest of the year. There will be no limit on product numbers. It will not be exclusive to certain users. There will be no time limit on its availability. The file is entirely free to download. We embrace open-source and sharing approach. It’s important to The Fabricant that everyone can access what we do. We’re designing for our digital fashion future, not living by an outmoded model of behaviour that was created in previous centuries for a different mindset. For The Fabricant, the digital-only fashion arena is a place of freedom, fantasy and self-expression. The fashion future we imagine is collaborative, creative and co-operative. Everyone should have the opportunity to realise their digital identity, or identities, in a way that they choose, expressing who they are, wish to be perceived, or want to become. Your virtual self can be an extension of your actual physical self - or something completely different. It’s your choice. The boundaries of the physical fashion world do not apply, or any of its rules about how to behave as an industry. We’re at year zero on the digital-only fashion timeline. We have the opportunity to avoid the mistakes of the past and participate in a fashion future that’s creative and sustainable: expressing ourselves while wasting nothing but data, exploiting nothing but the power of our imagination. The Fabricant knows that what we do will only be one part of the story. It’s time to co-create the fashion world we’ve always dreamed of. Let’s take this first step together. Exclusive design from the DEEP digital collection, by Amber Jae-Slooten, the Fabricant’s creative director. The collection represents the first fashion design collaboration between a human and a computer. In life they say that timing is everything. And for The Fabricant, 2018, our inaugural year operating as a digital fashion house, seamlessly coincided with the rise of digital transformation across the global fashion industry. The stunning creation that is @shudu.gram, the world’s first digital supermodel, starred in a campaign for Balmain and wore Tiffany jewellery for a shoot in Vogue. At the same moment, digitally-created teen influencer @lilmiquela stormed the fashion and music sectors while supporting the Black Lives Matter movement and gaining adoration from 1.5 million Instagram followers. The Fabricant added to the digital momentum when our co-founder and creative director, Amber-Jae Slooten, made the fashion and technology industries sit up and take notice with the DEEP Digital Fashion Collection. Using artificial intelligence algorithms, the creative experiment saw the world’s first collaboratively designed fashion collection between a human and a non-human – Amber essentially asking the computer to dream, learn and create alongside her. 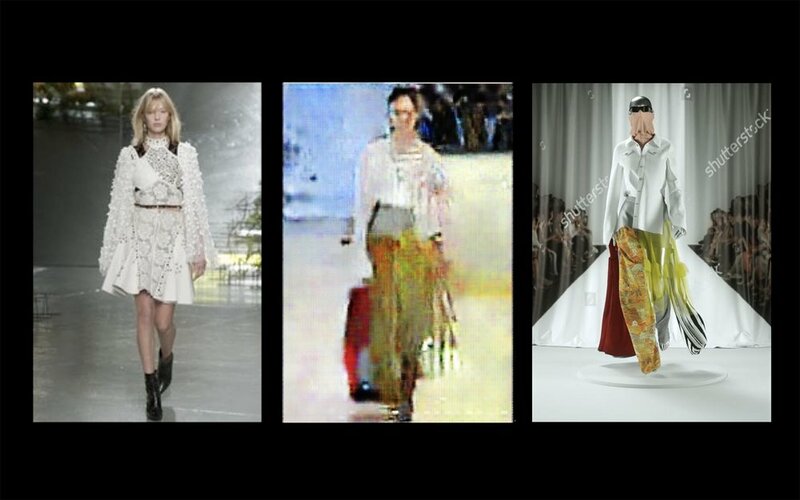 The resulting surreal digital collection exhibited at major fashion fairs across Europe throughout summer. De Toekomstbouwers (The Future Builders), a TV programme showcasing young design talents with ‘design visions that can change the future of humankind’. Further groundbreaking opportunities came our way when Hong Kong-based luxury fashion retailer ithk.com commissioned The Fabricant to digitally recreate a collection designed exclusively to celebrate its three decades at the helm of fashion in China. It’s the first time a retailer of I.T’s scale and reach has favoured representing an entire collection solely in digital form, signalling an industry game changer away from 20th century product photography. The garments, designed by labels including Marques Almeida, Helmut Lang and Alexander McQueen, were only seen in digital form both as a 60-second film created by The Fabricant showing the entire collection, and as individual 3D rendered still images. Ordering was available at unique digital-only pop-up stores at locations across China. The Fabricant’s sustainability credentials came into play with a commission from Pakistan-based digital denim mill Soorty, suppliers to global retailers such as Tommy Hilfiger and C&A. As designers using nothing but data to create fashion collections and imagery, The Fabricant’s work exists beyond the current concepts of catwalks, photographers, studios and sample sizes. It was a proposition that naturally coexisted with Soorty’s innovative new Cradle-to-Cradle compliant Gold Standard denim fabric. The 60-second film created by the Fabricant in response to Soorty’s brief premiered at the Kingpins conference, the global gathering for the denim industry. It showcased the look, texture and movement of the new denim while only existing in the non-physical digital realm. The use of 3D rendering to promote their product perfectly complimented Soorty’s mission of reducing fashion’s environmental impact via the use of sustainable practices. An approach from design house Sadie Clayton threw up a new twist to The Fabricant’s exploration of the intersection between fashion and technology. Clayton had created a one-off couture copper and cobalt jacket that was stolen at a fashion event. Devastated by its loss and irreplaceability in the physical world, Clayton provided photographs of the piece to The Fabricant which allowed us to digitally recreate the jacket in fine 3D detail, ensuring the design and workmanship was archived for her design catalogue. With the dawn of 2019 imminent, Bloomberg predicts that it will be the year when members of Generation Z outnumber Millennials for the first time, making up 2.47 billion of the 7.7 billion people on the planet. Representing individuals born after 1997, they are the world’s first generation of true digital natives. The Fabricant’s second year of operations promises a multitude of creative opportunities as groundbreaking fashion and lifestyle brands explore new digital avenues. Generation Z’s awareness of the digital realm and its endless possibilities for self-expression and creativity are utterly instinctive. The Fabricant can’t wait to co-create with this new wave of collaborators who already helping to shape our digital identities in the years to come. Amber Jae Slooten, co-founder and creative director of digital fashion house The Fabricant, has been selected to be participate in De Toekomstbouwers (The Future Builders), a TV programme showcasing young design talents with ‘design visions that can change the future of humankind’. the largest design event in northern Europe. Slooten is one of only 8 designers selected from the thousands of exhibitors at the week-long event. Slooten and The Fabricant’s innovative project, the DEEP Digital Fashion Collection, will be in its second iteration at Dutch Design Week, having toured throughout summer at fashion festivals across Europe. The collection represents the first fashion design collaboration between a human and a computer. The resulting hypnotising 3D animations of outfits were initially conceptualised by the computer after receiving imagery and data fed into it by Slooten. The DEEP collection will be displayed throughout Dutch Design Week in collaboration with Modebelofte, at the old V&D building in the centre of Eindhoven. Slooten will be featured on De Toekomstbouwers on Thursday 25 October 2018 at 23:00 on NPO 2. Proof that clothes do not need to be physical to exist. As a fashion designer creating purely for the digital space, Slooten aims to show consumers and viewers of De Toekomstbouwers that the future of fashion is digital, proving that clothes do not need to be physical to exist. In line with her work at The Fabricant, Slooten will encourage consumers towards a fashion future in which they fit virtual clothing on a 3D model of themselves. In doing so, she wants to prevent fashion being over-produced and unsold, which currently contributes to waste and excess stock destruction on a massive scale. According to research collated by the Ellen MacArthur Foundation, global clothing production has doubled in the past 15 years, with garments on average being worn much less and discarded faster than before. Defining the digital future of fashion further we have setup The Fabricant as a ‘Digital Fashion House’. We are defining a new space in the fashion industry to challenge traditions and conventions of this slightly fragmented industry. Technology is moving fast and our mission is to include fashion as part of this landslide shift towards digitisation. From design, to eComm to virtual fitting/sizing. Starting by designing digital fashion collections to live exclusively in the digital space with no intention of entering the physical. We will be releasing more info on this the coming weeks and months. The weekend of 15-17 June 2018 we presented the first ever complete digital fashion collection designed by Amber Jae Slooten. Our exhibition was in an old retail space where we hung eight strips of plexiglass to create a screen 4m x 2.5m that allowed us to present the clothing in life-size. The responses from international press, festival audience and general crowd walking by the store (that was situated in the middle of a mall) was overwhelming. The exhibition will be published on several channels. we will produce a case study around the collection, exhibition and responses shortly. This video is one of the seven outfits. On June 15th we will present over a years worth of research and development at Fashion Clash Festival in Maastricht. A collection of seven digital outfits set in derelict Wild West environments surrounded by the remnants of the traditional (old) fashion industry. Our social media channels have been activated. The concept and content will slowly be revealed up until the festival starts. A few days later we'll be in Paris presenting it at Atelier Néerlandais next to the works of Iris van Herpen and other influential Dutch fashion designers. And finally on the 24th June presenting at We Make The City festival in our home town (digital fashion capital) Amsterdam. Two weeks ago AMFI hosted an event with ATACAC (www.atacac.com) the most progressive fashion brand in regards to digitization that I’m aware of. It was only open for a selected few students and professionals who are involved in digital fashion. Several digital designers from PVH (Owner Tommy Hilfiger, CK etc.) were present together with digital fashion graduates. That day more than 50% of Amsterdam’s digital fashion designers were present in one room. Hearing from the students it’s obvious that they have a real need for working digitally more than before. The educational institutions are not providing enough supply for the demand. Part of the mission of The Fabricant is to combine talents from fashion and 3D industries. We will begin hosting inspirational evenings and workshops combining people from these industries in the last quarter of this year. If you are interested in joining this please do get in touch via hello@thefabricant.com I will add you on the shortlist. After almost two years of development and projects we launch our first website with all our work from the previous years. This endeavour grew organically from pure desire to create work in the space between fashion and animation. Combining designers from both fashion and animation industries we look forward to working with established brands and designers to bring their creations alive on a digital realm. Having already experienced and seen all the things that the transition of the film industry created from analog to digital allows us to imagine and develop the digital future of the fashion industry. A fashion designer collaborating with the biggest visual effects company in the world? Canadian designer Steven Tai collaborated with ILMxLAB to produce an immersive fashion experience at London Fashion Week. Industrial Light and Magic aka ILM is best known for delivering the best visual effects in movies since the first Star Wars trilogy. Now with their LAB division they're apparently trying to break out of cinematic experiences to other fields. Previously we've seen Star Wars hologram experiences and now they're taking a crack at fashion. On Fashion Innovation Agency website there's a full article on the project itself. This was announced a few months back. I was excited to see what the hype was all about. The experience was a combination of live-motion capture that was projected on a large format display behind the models. The screen combined virtual characters together with real models. Yet, the event stays exclusive to the audience that was present on the day itself. There is an opportunity there to make it accessible to the masses through the digital aspect. Virtual characters are becoming more popular as we move further into our digital lives. Photographer Cameron-James Wilson created Shudu, a character somewhere between fantasy and real. 'She' has already gotten a following of over 37k on Instagram.